Poor Martin's Almanac: Parade Magazine, 10 Days Behind the Story? Parade Magazine, 10 Days Behind the Story? You’re reading that headline correctly. The cover and the associated article discuss the late Benazir Bhutto’s election prospects in the present tense, errantly describing her as alive and probing the consequences her success in the now much delayed election would have for Pakistan and the United States. 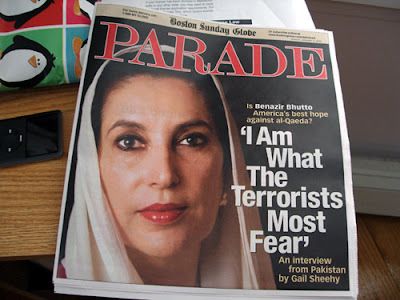 Randy Siegel, Parade’s publisher, points out that the magazine went to press on Dec. 21 (a stunning 15 days before distribution) and was already on its way to the 400 newspapers that distribute it when Bhutto was killed in a Dec. 27 shooting and bombing attack at a campaign rally in her country. Several of the hundreds of newspapers that carry Parade, including The Washington Post, ran editor's notes on the front page or elsewhere explaining that the magazine had gone to press before Bhutto's death. One wonders why Parade didn’t print its own note or insert explaining the editorial lapse. They had 10 days, after all. This lack of agility demonstrated by Parade is astounding, especially when compared to rapid editorial reversals the newsweeklies Time, Newsweek, and US News and World Report regularly accomplish. At best, readers caught the error and knew enough to temper the article’s rhetorical questions with the grim certainty of Bhutto’s assassination. At worst, Americans confused and under informed about the situation in Pakistan and the Muslim world will be plunged into further misunderstanding. In the mean, I expect most Americans will realize it was just a bad – if not embarrassing – editorial decision.